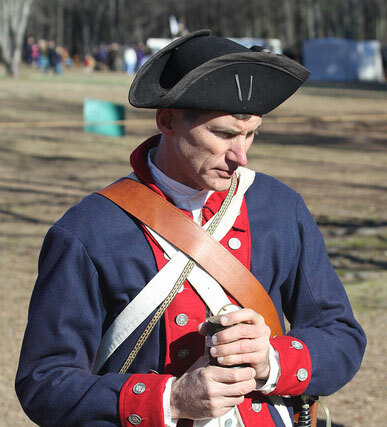 Christopher Rucker, MD, is an artillerist at the Cowpens National Battlefield, where his volunteer crew interprets the use of the two British cannon used at the January 1781 battle. Here he provides some of the common queries his crew receives at the battle’s annual anniversary. Answer: A battle’s winner is not decided like a spitting contest. The more germane question should be: what is the effective range of the cannon? This 3 pounder can hit targets which are hundreds of yards more distant than the range of a musket, which is why the artillery rules the battlefield. Answer: It is called a 3 pounder because it shoots primarily a solid iron ball weighing three pounds. A 6 pounder shoots a six pound ball, etc. The gun can also shoot canister, which is a tin can containing musket balls; the can disintegrates at the cannon’s mouth, the balls producing an effect akin to a large shotgun. Canister is a very effective antipersonnel round at close ranges. Answer: There are people and vehicles and houses not very far beyond the clump of trees in our front. This is not a video game. We cannot shoot projectiles which would endanger lives and property. Answer: No, but my friend over there with the sponge-rammer was personal friends with Gen. Lafayette, and you should go over and ask him all about the general’s children. Answer: We have not conducted such research. I suspect that we could not find enough volunteers to arrive at an acceptable answer. Several, surely. Many, possibly. Depends on the range. Answer: Costumes are what you wear on Halloween. We are wearing uniforms. The two cannons here at the Cowpens were British, captured by the Americans, some of whom were regulars, some militia. Therefore, our six crew members are wearing Continental uniforms, British uniforms, and back country civilian garb as examples of what were worn during the battle. Answer: The volunteers here have provided their own uniforms, arms, accoutrements, tents, etc. We are here because we love history, and love to teach. We are paid by the satisfaction of questions answered, and curiosity kindled. Your thanks and the appreciation of the Park Service personnel keeps us coming back. Answer: Some of us did. Some came directly from home, and will return home after the battle to a warm featherbed. Just like the militia was wont to do in 1781. Answer: This gun is made of bronze, which is an alloy of copper and primarily tin. That other gun is made of iron. Bronze was lighter, so was valued over iron, since it required less horseflesh and manpower to maneuver than an iron gun of the same size. Answer: Soldiers have always invented nicknames for their weapons. We suspect that the gun’s recoil in the tall grass suggested the hopping motion of a grasshopper. Answer: Please come and touch the cannon after we fire, to confirm that it is not a figment of your imagination. If you mean to differentiate between an original or a reproduction, this is one of a pair of repros given to the USA on our Bicentennial by the British. Pretty magnanimous of the Brits, seeing as how we took the originals from them in battle, every one of their cannoneers dying at his post to defend the guns. A point of honor in the artillery is to never surrender the piece. Answer: The entire weapon is called the “piece” or “the gun.” The barrel is the “tube,” which sits on the wheeled platform called the “carriage.” The piece was drawn by horse, or could be manipulated short distances on the battlefield by men called “mattrosses,” wielding ropes. The advantage of this small Grasshopper is its portability; it could negotiate the trackless back country without being mired in mud which would immobilize larger cannons, and it could be broken down into its components for transport on horseback, if needed. Answer: Please do not rely on Hollywood for your history lessons. A ball from a relatively long “gun” such as the 3 pounder travels a low trajectory, spending a short time in flight, too brief for a fused, hollow, explosive shell. A shorter mortar, or a howitzer, throws its projectiles at a higher trajectory, which allows enough time for the fuse in their hollow, powder-filled shells to explode the projectile over the target. Contact fuses were not used in the Revolutionary War, so shells didn’t explode on contact. Answer: That is a “sponge bucket,” used to dampen the sponge which is introduced into the bore to extinguish lingering sparks from the previous charge. Sparks and fire are the bane of the artillerist, and our drill is designed to minimize the risk of a “premature ignition” which could cause an “energetic disassembly” of the cannon and its crew. Answer: See question 3. Without the resistance of a projectile, the force of the rapidly expanding gases during ignition of the charge exits the barrel without producing a visible “equal and opposite” reaction of a recoil. When you watch our drill, the crew is careful to stay outside the wheels as much as possible, so that a recoiling gun doesn’t cause injury. Answer: Enough to make noise. The propellant is properly called “black powder” and is a mixture of potassium nitrate (nitre), sulfur and charcoal, just like in 1781. The 3 pounder used charges ranging from four to eight ounces, packaged in a linen bag, to which the ball was strapped with a wooden disc called a sabot. We use aluminum foil instead of linen, and find that four ounces of powder is plenty loud for the purpose of a demonstration. Answer: We are using a “quill” placed in the vent hole on top of the cannon, which communicates with the tube’s interior. Hollow goose feather quills, or its modern equivalent of a soda straw filled with black powder, do good service, and offer more rapid ignition than a fuse, important when the target is moving. For demonstration purposes, we use a paper quill, ignited by a smoldering “slow match” held in the “linstock.” During the War, waterproof tin tubes filled with powder were preferentially used over quills, lit by a flare-like device called a portfire, which was lit by the linstock. Answer: I believe that you are confusing two different conflicts. Small cannons such as this Grasshopper were obsolete by the end of the Revolution, relegated to British provincial outposts. It is uncertain whether the two original three pounders used at the Cowpens still exist, although they are known to have changed hands several times during the war. They may have suffered an ignominious demise by being melted for scrap, an unworthy end for weapons whose crews died defending them. Check out the demonstrations below. I apologize for the shaky video (but consider yourself fortunate I did not drop my phone all together after a cannon fires). Next year I’m bringing a tripod.